I did some training sessions this week for my staff on using wikispaces.com to create your own classroom, department or house wiki. Many seemed to take some steps toward really seeing how having their own website/wiki could be beneficial. 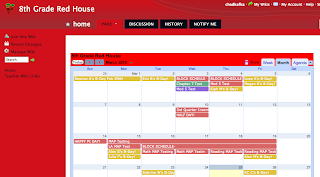 One of the questions I was asked a lot was, "how do I put a Calendar in my wiki?" Some of our staff that have created a wiki have embedded a Google Calendar with assignments, class birthdays, tests, projects, and the like. This has gone over very well and what better way to help keep students organized. Our middle school works on a HOUSE system where there are 4-5 Core teachers that have the same kids in a "house." One House decided to create a single calendar for Math, single calendar for Social Studies, single calendar for Language Arts and so on. In the end, the staff only wanted to embed ONE calendar on the wiki that had all the Core class information on it that was color coded (see example below). Great way to organize the information for the students. My advice if you do this is to have one staff member in the house or system create the calendars in Google Calendar and then SHARE each calendar to the other staff members so all staff members have editing rights. Google Calendar Tour - This walk through shows all the basics of Google Calendar. Demo - This demo was created for potential Google Calendar customers who want to add Google Cal to their website. The walk through and explanations are really good. CNet Review Video - CNet reviewed Google Calendar and walks through how to use and setup your own Google Calendar. Expert Village Google Calendar Videos - Expert Village has about 10 videos showing you all the features of Google Calendar. Google Calendar Tutorial Videos - short videos that explain the features and functions for using Google Calendar. I put together a handout explaining how to embed a SINGLE calendar or MULTIPLE calendars like the one above using Google Calendar. Feel free to take and use. My life is centered around Google Calendar. Great for synching with mobile devices as well! Enjoy!